Calves are tender creatures and whether nursing on the mom or being fed by humans, calves may succumb to a number of illnesses. Consider raising your own calves or purchasing healthy animals only from healthy herds to save yourself from the heartache of bringing diseases onto your farm. Calf-raising will be much easier that way! In cases where a calf has a high fever, is lethargic/dull eyed/unable to stand, or other serious symptoms, consider contacting your vet for immediate treatment. Likely the most common “sickness” among calves, there are many different types of calf scours. I would initially treat almost all situations with natural methods (electrolytes and supplements) before considering more drastic or environmentally-impacting measures. Write down the following information about your calf to compare to information on different types of scours. By writing down the information as it happens, you can give your brain a break from having to remember all the details. Muddling through several reading sources can make a person easily distracted. Did cow calve in pen where other cows had calved and/or a wet area? Was mother cow vaccinated prior to calving, if so, with what? Did calf receive colostrum, what type of colostrum (from mother, powdered, etc. ), how many hours after birth was first colostrum given, how many doses of colostrum? Is mother cow or cows in herd known to be infected with diarrhea-related diseases? Initially, consider the possibility of “milk scours” which is NOT a disease but rather a symptom of rich milk feeding – more commonly found on family farms where calves are fed an abundance of milk or receive milk from a nurse cow. In my experience, milk scours from too-rich milk are usually gray or white and runny, maybe even liquid. I’ve seen it stay manure color and just be liquid, but that’s less common. I have seen blood streaks, but that’s less common as well. In all cases, Whew! is it STINKY!! The calf usually acts 100% normal, but sometimes they will kick at their belly or hunch when going to the bathroom (it can be acidic). Severe or long-acting cases of milk scours can cause significant discomfort in a calf (akin to a human with a terrible belly ache). For a bottle- or bucket-fed calf: If the calf is happy, nursing, active, alert, then I proceed as normal, but with either skimmed milk or watered-down milk. Skimmed is nice because you’re getting everything except that excess cream, whereas watered down milk is just…watered down, still proportionally a lot of cream. Feedings could also be given in smaller amounts more frequently (for example: Say you’re feeding 1 gallon of milk per day to a young calf. Consider feeding one quart, four times per day for a few days or until symptoms subside). Both methods should work to relieve the scours. Literally within a feeding or two, the manure may be significantly better and the calf should be back to normal in approximately 48-72 hours. TIP: We’ve had better success keeping a calf on a bottle for the first month of life (early life is highest risk/sensitivity to scours), then transitioning to a bucket – allowing for careful measuring of milk as the milk is slowly increased to the amount you want to feed the calf and increase as the calf grows/ages. For a calf on a cow, limited feeding times and limited feeding amounts may be necessary for a period of time until the calf’s stomach adjusts or the cow’s production decreases to match the amount the calf is nursing. Some people choose to milk their dairy cow once or twice a day for the first few months, in addition to having the calf nurse the cow, because dairy cows are genetically improved to provide milk for much more than one calf can consume. Prevention of milk scours: Feed milk consistently – the same amount and same time each day, as possible. Make changes slowly – gradual increase is much safer than increasing by large amounts quickly. The following can be added to milk to supplement/improve digestion for a few feedings. Dehydration is often the most dangerous symptom of scours in calves and is one of the most important symptoms to remedy first. Natural remedies are often all that is needed in mild cases of scours and for milk scours. The following recipes imply a “regular” calf feeding of a half gallon-sized calf bottle or bucket of milk/replacer. SLIPPERY ELM: 1-3 capsules or 1 tsp. to 1 Tbsp. (depending on how liquid the scouring is, give a higher dose for more liquid scours) included in milk or hand-fed just before feeding milk. Slippery Elm works to soothe the mucous membranes of the intestinal tract, improving absorption of fluids. CALF RENNET: Using a syringe (without needle attached), dilute 1/2 tsp. rennet in several cc warm water and squirt in the back of the mouth of the calf just before feeding milk. Alternate option: Add 1/4 to 1/2 tsp. liquid calf rennet to the milk feeding and feed immediately. If you wait too long to feed the renneted milk, the milk will coagulate (become solid) and not come out the bottle. This illustrates the very reason for using rennet – it helps solidify the milk to slow digestion and temporarily aid in slowing diarrhea. It’s just important for that coagulation action to take place in the stomach and not beforehand! 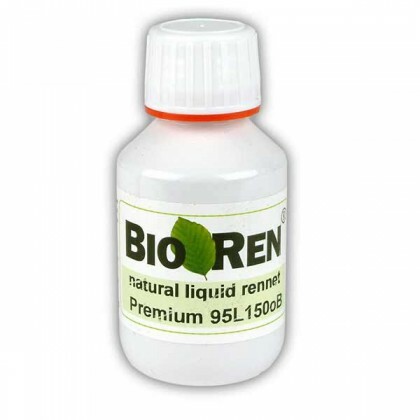 Other types of rennet will also work – follow package dosage for what you would use to make a 1 gal. batch of cheese. PROBIOTICS: Add recommended package dosage to the bottle of milk before feeding or hand-feed just before feeding milk. Probiotics help repopulate the gut with beneficial bacteria (and in some blends, beneficial yeast) to restore the balance of gut flora that plays a large role in proper digestion of food. This is an essential addition if feeding milk replacer or if the calf is sick. Fresh, healthy raw milk should have sufficient enzymes for the calf to be able to digest milk but any processed milks would benefit from the addition of probiotic. Fastrack probiotic contains a higher dosage of beneficial bacteria, so is a more effective probiotic. A less potent probiotic brand is Probios – commonly found at feed stores. Keep in fridge or freezer. Honestly, we rarely have calves sick, so if we need to use probiotics on an animal, I open a capsule of our human probiotics and feed a weight-adjusted dosage from that, because high quality probiotics intended for human use are kept refrigerated (keeps the live bacteria alive in a dormant state) and come in much higher dosages. For example, an animal probiotic may be only 1 to 10 million count per dose, whereas a human probiotic could contain as much as 80 billion per capsule! ELECTROLYTES: Feed regular or skimmed/light milk feeding in AM and PM with a mid-day feeding of electrolytes (half to full bottle of water with % powdered electrolytes added as directed in package. Resorb is a great “calf-specific” brand, but there are also other “multi-species” brands available that can work in a pinch. Electrolytes help balance the inner workings of a calf’s digestion (similar as for humans) and helps with hydration while the calf is improving in health. Electrolytes should always be considered as a first treatment for scours. The glucose and sodium in electrolytes allow the animal to absorb the water they need from their digestive tract. Straight water only flushes straight through a sick animal. If your calf gets to the point you think antibiotics are necessary, contact your vet (at least for a recommendation on which product to use and how much). Before giving antibiotics, consider the natural toxin-binding agent: Activated Charcoal – A few hours before taking other medicine, activated charcoal can be given to a calf. A suggested method – place 2 or 3 human-grade capsules in the mouth of a calf, then immediately feed the calf half of a bottle with a light milk, milk replacer or plain warm water. Give at least 2 hours for the charcoal to work through the system of the calf before giving medicines or other food (otherwise the charcoal can bind with the medicines and/or food nutrients, flushing them out before they can be absorbed). Charcoal, like slippery elm, requires a large amount of water to help flush the toxins from the intestinal tract. Providing sufficient water when giving these remedies is essential. A well-known antibiotic tablet for young cattle is Sustain III, but should not be used for calves under 30 days old and has restrictions for calves fed on an all-milk diet. Please read directions thoroughly before administering medicines to calves. A calf given antibiotics should ALWAYS be followed up with probiotics – the calf’s gut needs to become re-populated with GOOD bacteria after the antibiotics remove both good and bad bacteria from the calf’s digestive tract. Remember, please do your part to prevent antibiotic resistance! Try safer alternatives first! Feed colostrum ASAP after birth – we always milk out one calf bottle full of colostrum and feed that to the calf within an hour or two of birth to ensure the calf receives its first immunity right away. The effects of colostrum are only absorbed in the first 12-24 hours of life, so prompt feeding is essential. House calves in clean housing. If calves scouring from pathogenic bacteria live in one area, put new calves in a separate NEW location that has not housed calves for at least a year. Or, scrape ground and place a thick layer of sand down before placing calf hutch on top. If calves are raised healthy and never scour, calves can be placed in the same area subsequent times. Provide sunshine daily – even in winter, cows should have access to an area where they can feel sunshine on bright days. Keep bedding area dry and clean – much out saturated areas and replace with fresh bedding. Consider a layered pack (straw, shavings, straw, shavings) to allow for a lofty bed that drains well. Disinfect areas when able – between calves clean out entire bedding and allow area to dry between uses. Can also sprinkle Diatomaceous Earth (DE) or lime once dry for added protection. A dairy calf requires a large amount of calories in the first 6 months of life.Poor feeding is a contributor to disease. Feed the best quality milk or milk-based replacer (not soy). Maximize milk feeding for as long as possible and limit grain as much as possible. Feed enough grain to maintain body condition if milk is in limited supply. Freshen grain and/or hay at least once daily to encourage the calf to eat and reduce contamination (bird poop, etc.). Navel ill occurs when a newborn calf’s umbilical cord is exposed to pathogens that travel up the cord into the navel area before the navel has had time to dry and heal shut. Navel ill can be prevented by dipping every newborn calf with 7% Iodine tincture (undiluted) ASAP after birth. I have not personally experienced a calf with this problem, but it is quite prevalent and very dangerous to the calf’s health and longevity. I know someone that had a heifer born that got sick with navel ill. They were able to save the heifer’s life, but her ability to grow, thrive, and live a productive life was questionable. Pneumonia in calves is extremely serious for many reasons. Cattle have small lungs in relation to the size of their body – so cows of any age are susceptible to lung illnesses and the impact can be dramatic in cattle. If a calf fights pneumonia, the effects can last for a lifetime – inhibiting general health for the rest of the animal’s life, reducing their productive lifespan. Ventilation allows for cross-flow of fresh air – this is important year-round! Cows need more ventiation than most people realize. They do not want to be snugly locked up in a super tightly enclosed barn. Rather, they need protection from wind and wet weather. A good example of proper ventilation would be a barn with a roof and walls half way up – the top half open for air flow or with only three walls (the walls in the directions most likely for wind and weather). Vaccinations: If pneumonia is becoming a frequent problem on your farm, consider working with a vet to diagnose and test for possible related diseases and corresponding vaccines that may help prevent future infections. In the few cases of pneumonia I have been around (mostly cows that were treated for pneumonia as calves) the calf may survive, but the long-lasting effects tend to compromise the health of the animal by showing back up during times of stress, ie: calving, and reduce the productive lifespan of the animal.